Y'all, I am so tired. I haven't had a bout of insomnia in a while, but one struck with a vengeance last night. I lay awake from 2-4 a.m. before I finally nodded back off, and let me tell you, I FELT IT this morning! I've spent the majority of my day lounging on the couch with a Bout of Books book. But more on that in a second. First off, I'm terribly jealous that I won't be meeting up with ALL THE BLOGGERS in Chicago for BEA this week, but I do hope that each and every one of you has a great time. Hug each other, squish each others' faces, and pour one out for me. Next, I am on a reading rampage. 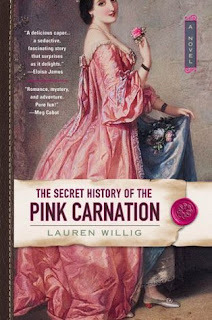 I picked up The Secret History of the Pink Carnation by Lauren Willig after some other TBR books fell prey to my finicky whims. This one is just enough romance and swashbuckling to make me smile. I also decided to pick up an audiobook for Bout of Books for those moments when I need to clean the house, go for a run, or commute to work. I'm working on Ready Player One by Ernest Cline because it has been on my shelves for an embarrassingly long time. I've always had a hard time getting into the flow of the writing, but audio is perfect for this book. Will Wheaton ftw! 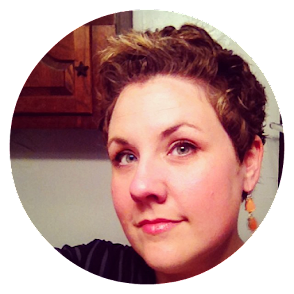 So yeah, on the whole, genre fiction is really blowing my skirt up. Sometimes you just need to escape, right? It's a great way to be introduced to audio! I can't remember which one I listened to first, but this one would've been awesome. Hate insomnia. Hope you get a good night's sleep this evening. Wouldn't it be fun to be at BEA - I'm going to go one of these days! Well, it was a sound night's sleep even if I didn't sleep very long! lol We should scheme to go next year and meet up! FINALLY! I haven't been to BEA. I had planned to go this year but when I left my job, that went right out the window. Sigh. Maybe next year. I'll save my pennies. :) I don't think I would've gone either after losing Tammy. Would love to hug your neck, but hopefully I can do that sooner rather than later. No Gulf Shores trip for us this summer, but I may be passing through in October! I go on insomnia kicks, too, mostly when I haven't been reading for a while (weirdly enough). The Pink Carnation sounds like something I need to pick up! Hmm, an odd connection indeed! Maybe reading relaxes you? Maybe speaks to the state of your brain when not reading? For me there's definitely a stress connection. I'm usually not sleeping well when I'm stress and not reading either. You DEFINITELY need to pick up Pink Carnation! It's also the beginning of a very long series apparently. I've been battling insomnia a lot lately. I blame it on the weather. I will occasionally take an Advil PM, but I hate to rely on medication to sleep and I really hate the drugged feeling/hangover in the morning. 5 a.m. is just to damn early to get up! I'm so excited that you're listening to Ready Player One. It's on my Top Ten list for audios! Loved it!! Yep, Will Wheaton is amazing. That hangover feeling is THE WORST. I try to avoid meds that give me that feeling at all costs...only if the insomnia has been going on for a while. It is so good! Will Wheaton has completely won me over. Great narrator. Urgh, I can relate to the insomnia. It always seems to hit me the night before I have to wake up super early (but of course). I've heard mixed reviews of Ready Player One but love the concept. I hadn't thought of the audiobook but now I've requested it from my library (for a future month when I'm not smashing my stack ;) - thank you! Yes! Me too! I hate it when I wake up every hour thinking I've overslept. That happens to often for me. 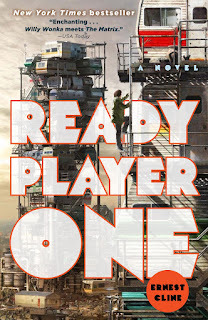 Ready Player One felt too "info dump" to me in writing, but I don't mind it on audio. Will Wheaton is amazing. TIME TRAVELING PIRATES? That sounds amazing! I need a title here. I have been having bouts of insomnia also. I wonder what is up with that? 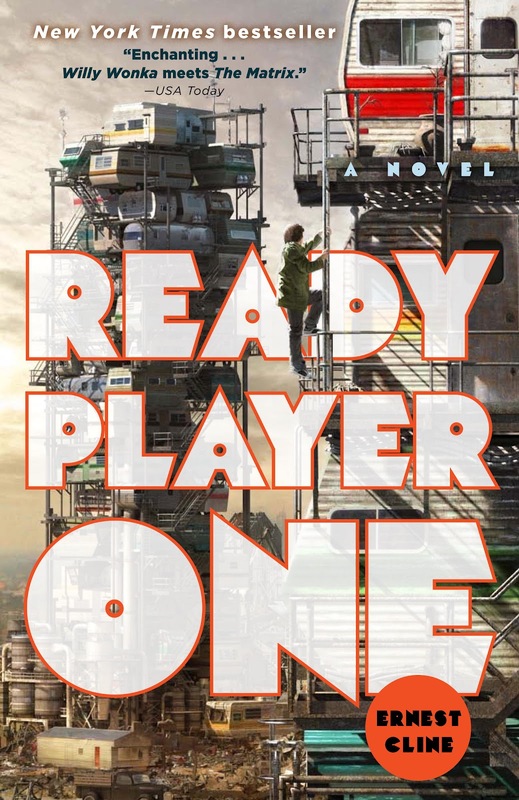 I read Ready Player One when it first came out and loved it! It was a really good book! I hate that it took me so long to read it, but I'm glad I finally tried the audio! Hope your insomnia resolves itself! Ready Player One was a big success with my high school students--especially guys. One student who hadn't read a book since 8th grade read Ready Player One in two days! "Sometimes you just need to escape, right?"